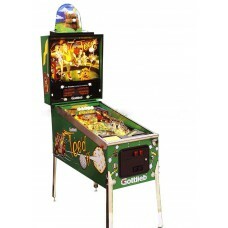 The table is often compared to No Good Gofers by Williams and features a Caddyshack type theme. An animatronic gopher named Gunthershrug shoulders in synch with voice during game play and sometimes during attract mode at the top of the backbox and mocks the player. 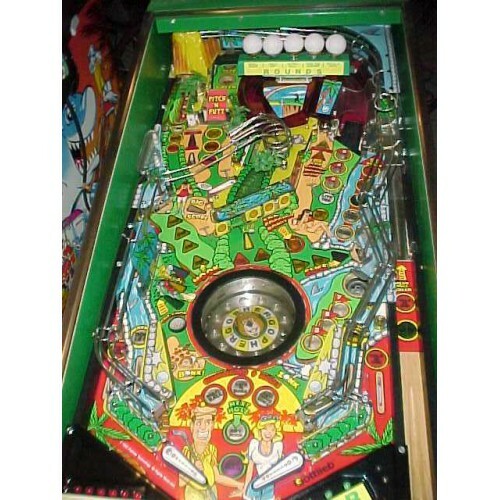 The game has a hole in one shot at the top, a roulette wheel toy, 3 flippers, 1 pop bumper, 2 vertical upkickers, 3 slingshots, 2 kick-out holes, 2 bullseye targets, 1 four-bank drop target, 1 captive ball and 1 captive ball spinner below center of playfield. The main objective of the table is to complete all 9 holes in right order. The game includes a pitch and putt mini playfield and mini-games like find-the-gopher. After all holes are lit an award is given depending on how many times all holes have been completed. The game has 5 modes that are started by shooting the volcano when lit. Completing all modes lights the big score target. Arcade Games Included with this purchase is a 1 year warranty. This warranty may vary depending on where you are located. If you are in the Metro Atlanta area, we include parts and labor under the warranty. If outside this area, we do not include labor under the warranty due to the fact that we cannot guarantee another companies work. However the parts would still be under warranty for the full 1 year. If you have any questions about this, please call us at 404-800-7975 to inquire.